Join KIX 105.7, 92.3 BOB FM and News/Talk 1050 KSIS, for our biggest and best event of the year! 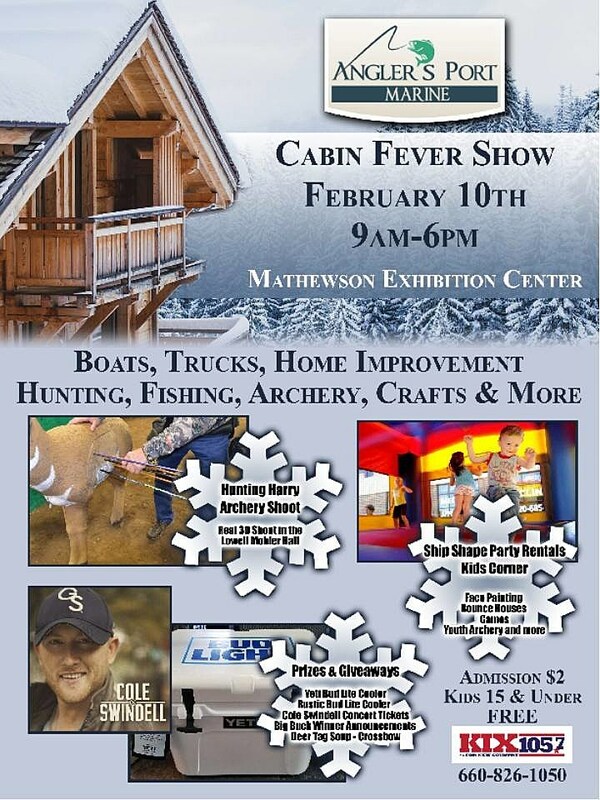 The Angler’s Port Marine Cabin Fever Sport Show will be here before we know it. Doors will open from 9 a.m. to 6 p.m. on Saturday, February 10 for a day of family fun and excitement. Come February, people will be tired of winter and looking to get out of the house. The show provides the best mixture of arts, crafts, boats, cars, outdoors equipment, and entertainment. Admission is $2 per person and will be purchased at the door. Kids under 15 and all active military will get in for free. The Huntin and Fishin with Harry Archery Shoot will return this year. So, grab your bow and start practicing! This is one competition you won't want to miss. More details on the archery contest will be coming very soon. Ship Shape Party Rentals will sponsor this year's kids zone. We will have a giant camo bounce house, inflatable basketball, obstacle course, face painting, youth archery, plus the kids can meet Spider-Man! This year's show is going to have something for everyone. This year we are taking the prize drawings to another level! We will give away a Yeti Bud Lite cooler, rustic Bud Lite cooler, prizes for the Big Buck Contest, and we will have our annual deer tag soup drawing. We will announce the deer tag soup prize very soon. Visit 2209 S. Limit in Sedalia Mo.